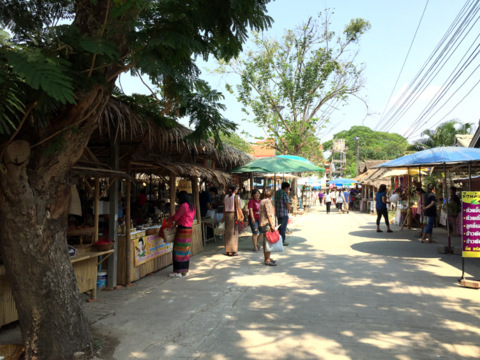 It was while I was looking at an atlas of highways in Thailand as we were planning our trip to Lopburi that I happened to see this market on the map along the way. The words that caught my eye were talard boran or traditional market and it certainly lived up to my expectations. What a wonderful discovery it turned out to be. What’s more this led to another cultural treasure nearby. Sometimes the chance encounters give the best results. Join us and find out more about Saraburi and the Ban Ton Tan Floating Market. Saraburi is a mere 110 km north of Bangkok. It doesn’t usually ring a bell with most foreign tourists unlike neighbouring Ayutthaya or Lopburi. In the reign of King Song Tham of Ayutthaya (1610 – 1628), a hunter found a huge footprint on a rock face in the forest. Religious authorities who examined it concluded that, as this was near a religious landmark, it must be the Buddha’s footprint (Phra Phutthabat) . The area was declared a holy area and a shrine and temple was built around the footprint in 1624. That temple Wat Phra Phutthabat is now a major religious and cultural landmark in Saraburi and the district where the temple is located is named Phra Phutthabat. Saraburi like Lopburi is also popular for her sunflower fields which bloom towards year end and in the early part of the year. Other natural treasures include ancient temples, national parks, waterfalls, caves, vineyards and even an archaeological site. 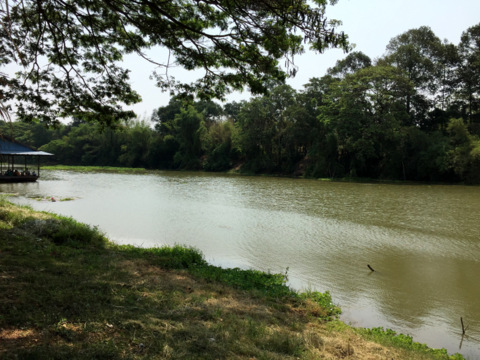 The Pasak River with its headwaters in Phetchabun more than 200 km to the north, flows through Lopburi and Saraburi before joining the Chao Phraya at Ayutthaya. 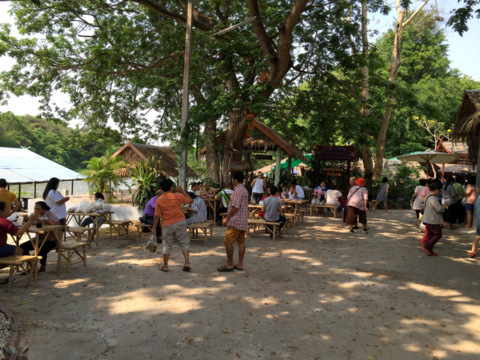 It’s along this scenic river that the Ban Ton Tan Floating Market is located. 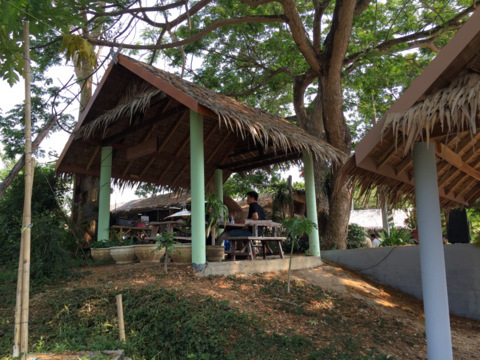 Sao Hai is one of the 13 districts (amphur) in Saraburi Province. The district got its name from a quaint legend. When Bangkok was built, all the provinces were asked to submit a pillar as part of a competition to select the best one for the city pillar. The pillar from Saraburi was made from takian, a hardwood tree and the log 13 m in length and 0.75 m in diameter was floated down the river to Bangkok. Unfortunately it arrived late and missed the competition. The pillar was floated back and as it reached home, it sank in the river. The villagers were saddened by this setback and called the pillar "sao ronghai or crying pillar". In 1958 a log believed to be this pillar was found in the river near the community. It was recovered and installed in Wat Sung, a temple in the district. 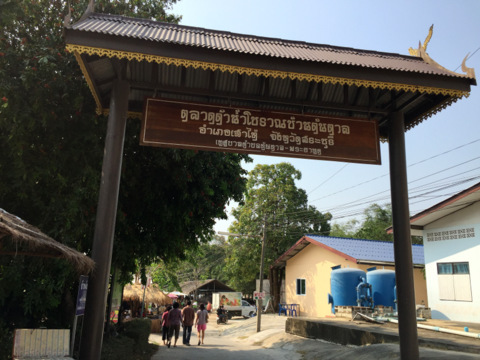 The people believe that a female spirit Takhian Thong lives in the pillar and a shrine, the Chao Mae Takhian Thong Shrine was built in Wat Sung to house the pillar. On some nights, so the legend goes, the sound of a woman crying could still be heard. 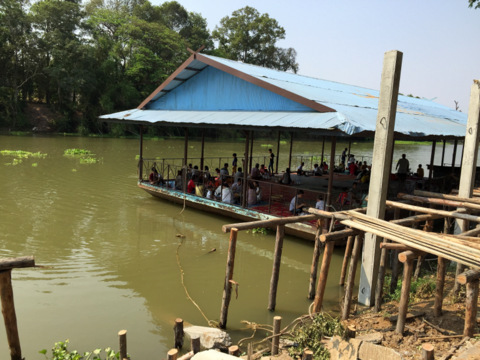 The sub-district (tambon) where the temple is located was named Tambon Sao Hai and the district Amphur Sao Hai. Every 23 April, the anniversary of the installation of the shrine, a grand ceremony attended by thousands is held at the shrine. Sao Hai district is also home the Tai Yuan community, an ethnic group from Chiang Saen in Chiang Rai, Northern Thailand. Their ancestors migrated here in the early Bangkok Era (18th C). 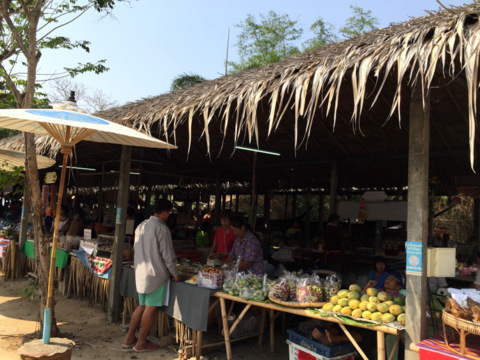 Ton Tan is one of the 12 sub-districts (tambon) in Sao Hai and it’s home to the Ban Ton Tan community who set up this traditional market by the Pasak. 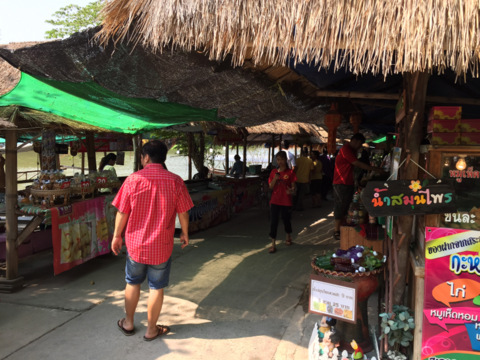 There’s no reason to cry when you visit Ban Ton Tan*, instead you will be delighted by the food and other attractive products on display. *Ton tan is the palmyra tree and the juice from the flower is used to make a very sweet non-alcoholic drink, nam tan, that is before it is fermented. Once fermented it becomes an alcoholic drink called palm wine popular in many parts of Asia and Africa. The alcoholic version is not popular in Thailand. 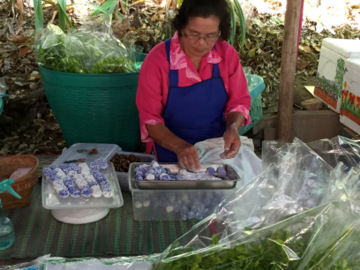 Residents of this community setup this market every Sunday to sell their homemade products. 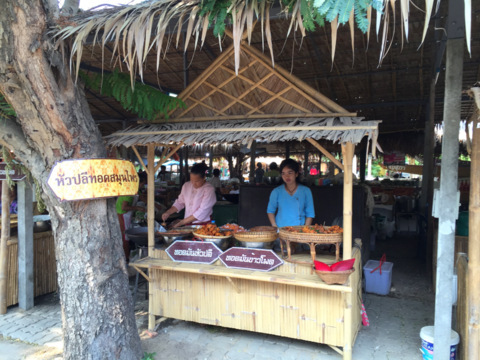 The stalls are housed in thatched huts. So are the dining areas. There’s even an anchored raft to serve as a floating dining area. What’s more many of the residents manning the stalls are dressed in traditional dress. 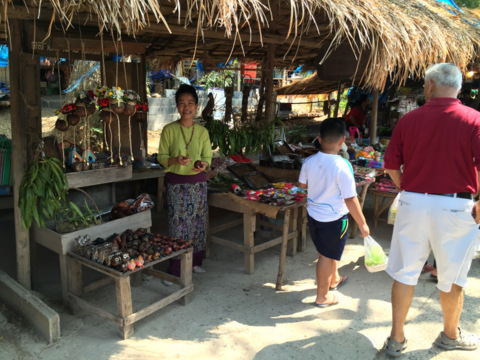 It’s a very local and non-touristy market with none of the pushy touts you find at some tourist attractions. The people here are extremely friendly and hospitable. We were hungry when we arrived at the market by mid-morning, so we homed in on the food first. This was the first thing we bit into. 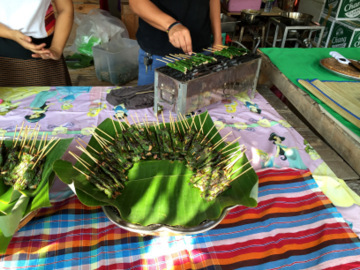 Mu yang bai cha phlu are barbecued pork strips on sticks something like satay except that the pork is wrapped in leaves of the cha phlu* and barbecued together to give that special flavour. 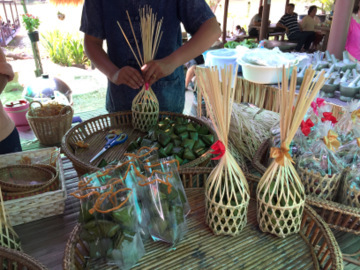 Kanom thian kaew is a delicacy of pyramidal pieces of translucent dough with bean fillings wrapped in banana leaves; the rattan cover is a work of art by itself. Don’t throw it away; it makes an attractive wrapping for a gift of a bottle of wine. 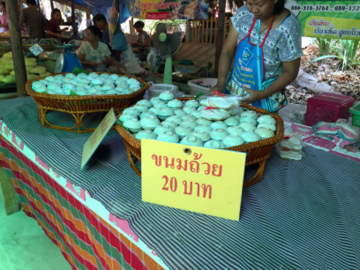 Chong muang is a desert made from the flour of sticky rice; the colouring is from dork an chan or butterfly pea, a purple flower. 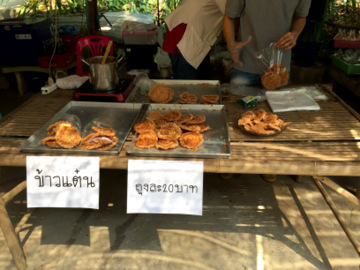 Khao taen is a crispy snack made from sticky rice flour pressed into pancake shapes and deep fried. Kanom tuay is a white coconut flavoured jelly served in small sauce plates. 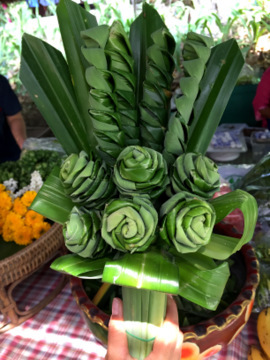 The artistry of the residents is plain to see, great pains are taken to produce the rattan wrappings and to fold these elaborate shapes from banana leaves. 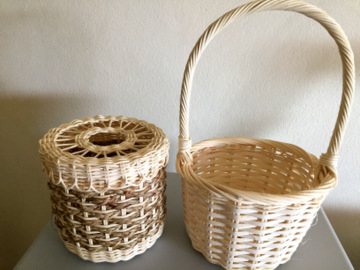 The baskets sold here make very useful home appliances and they are inexpensive too. 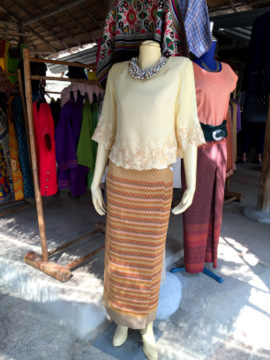 I didn’t expect to find these Thai dresses sold in a floating market and this was a pleasant surprise. This wasn’t so at the other floating markets I’ve visited. 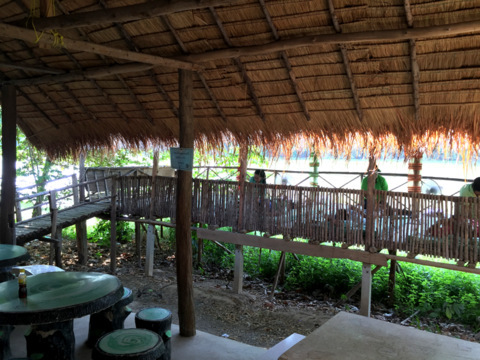 If you are tired after all that eating and shopping, drop by for a Thai massage right by the river. 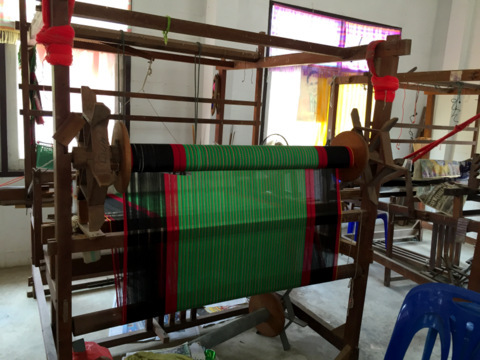 The Ban Ton Tan Weaving Group is located at the entrance of the floating market near Wat Ton Tan. It consists of three single storey buildings, two of which are filled with looms and work in progress. As this was a Sunday, there were only two women working at the looms. 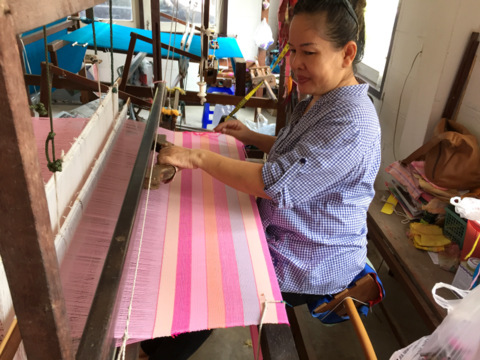 This weaving group was started by the women in the community to produce beautiful pieces of fabric which are sold in the souvenir shop, the third building. This kind of fabric is a specialty of the Tai Yuan of Sao Hai district. In the past almost every household will have a loom in the space below their raised traditional houses and the women will be weaving during the off planting season. The products were for personal use and the excess sold to augment household incomes. These skills are in danger of extinction owing to mass production of clothing in factories and the popularity of branded goods. Weaving demands infinite patience and skill, the slightest error and it has to start again from scratch. Not many today are prepared for such a demanding task. A centre like this helps to preserve a skill that’s handed down over generations. The Ban Ton Tan Cultural Centre is currently under construction. It would be interesting to learn more about this community when the cultural centre eventually opens. 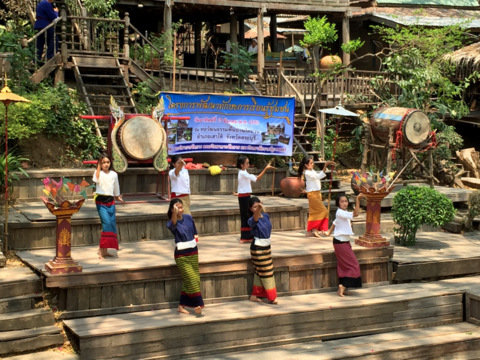 It’s heartening to see a community make a concerted effort to preserve its cultural heritage. As we were having a last snack washed down with steaming hot coffee, the lady running the coffee stall told us about the Tai Yuan Cultural Centre down the road and the cultural display that Sunday afternoon. This turned out to be a gem of a find and by sheer chance too. We will be covering this cultural treasure next month. Don’t miss this! Turn left at Wat Pho – head south – turn left to Route 3050 – continue on till you reach Wat Ton Tan, the floating is next to the temple. Parking is available in the temple grounds.